I am happy to share my new publication “What does it mean to be ‘Irish’? 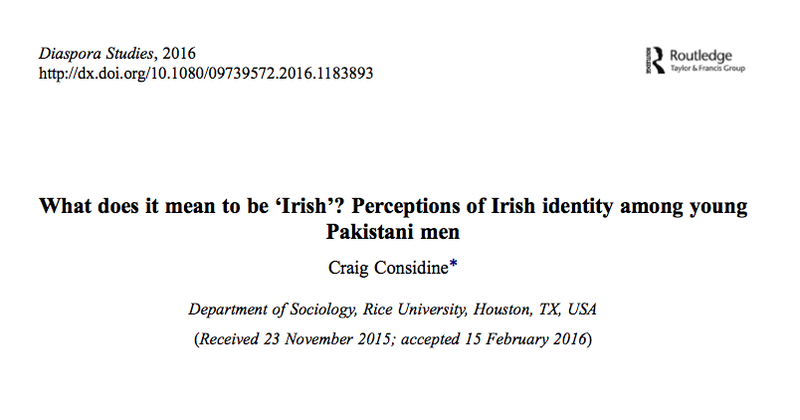 Perceptions of Irish identity among young Pakistani men” in Diaspora Studies (published by Routledge – Taylor & Francis). Abstract: The aim of this paper is to contribute to the discussion surrounding national identity by considering a particular set of empirical data on perceptions of ‘Irishness’. Based on ethnographic research carried out in Pakistani communities in Dublin, this paper considers various interpretations of Irish identity through the lens of young second-generation Pakistani Irish men. The data presented highlight that for these young men, ‘Irishness’ has multiple meanings. The views of the participants raise several types of Irish identity and how these types manifest themselves in the everyday lives of Pakistanis. To frame the discussion, the paper examines three terms: cultural nation, civic nation, and ethnic nation. According to the cultural nation, ‘Irishness’ is a matter of lifestyle to which one adheres; the civic nation defines Irish identity on citizenship; and the ethnic nation defines as ‘Irish’ those individuals believed to have Irish ancestry or blood. A key finding is that respondents are perceived by people of Irish ancestry as threatening to mainstream views of ‘Irishness’. As such, young second-generation Pakistani Irish men are less likely to be viewed as members of a common, shared national community in Ireland. You can download the article on this Routledge – Taylor and Francis page.